Art can occupy a unique position in a wealthy individual or family office’s portfolio. It is both an “investment of passion” for art lovers but is increasingly viewed as an asset class in its own right too. This is very often a part of a portfolio that wealth managers and private banks struggle to advise on. 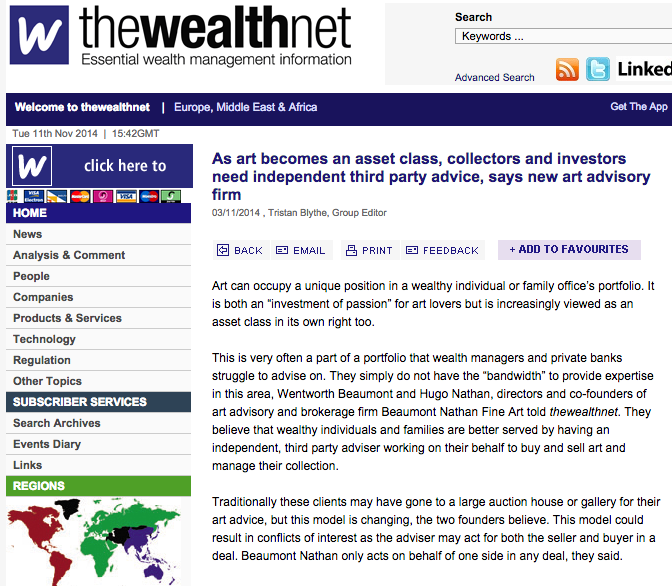 They simply do not have the “bandwidth” to provide expertise in this area, Wentworth Beaumont and Hugo Nathan, directors and co-founders of art advisory and brokerage firm Beaumont Nathan Fine Art told thewealthnet. 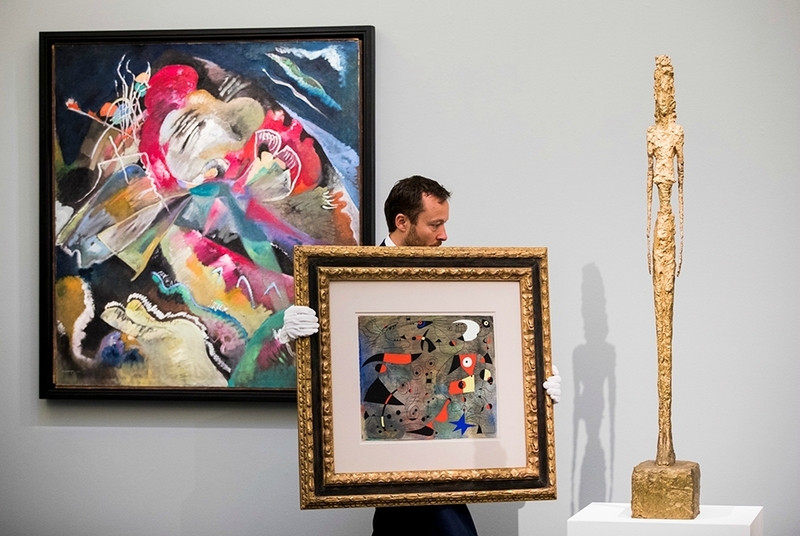 They believe that wealthy individuals and families are better served by having an independent, third party adviser working on their behalf to buy and sell art and manage their collection. Traditionally these clients may have gone to a large auction house or gallery for their art advice, but this model is changing, the two founders believe. This model could result in conflicts of interest as the adviser may act for both the seller and buyer in a deal. Beaumont Nathan only acts on behalf of one side in any deal, they said. The co-founders have a combined 30 years of experience in the art market. Mr Beaumont spent five years at Christie’s, working between London and New York, followed by five years at Dickinson. Mr Nathan worked for Dickinson from 1999, running their New York gallery from 2007 to 2013. They can advise on a range of art from Old Masters to Impressionist and Modern, Twentieth Century British and Post-War Contemporary art. The business acts internationally and has expert consultants and an international advisory board, which includes fund manager Crispin Odey. The two founders are supported by associate director Sophie Garnier. Ms Garnier previously worked at Sotheby’s, in the Modern British department and more recently alongside Mr Nathan and Mr Beaumont in the three years prior to the establishment of the new firm. She is responsible for research, analysis, logistics and administration. The firm was established in May this year, so is still developing some of its systems. The two founders expect to it continue to grow and are building in the ability to continue to take on clients. They already are gaining introductions from wealth managers, private banks and acting for family offices – areas they expect to more work to flow from. The business also works with corporations. Mr Beaumont and Mr Nathan aim to take an “efficient” route to growing the business. This means that it does not advertise, get involved with art fairs or have a gallery ‘shop front’. It prefers to build business through word of mouth, referrals and existing connections. It also aims to provide a long term service to existing clients as trusted advisers, rather than carry out one off transactional work and then chase after a new client, the co-founders said. This also allows them to keep fees and commission as low as possible. This is an element the pair believes is important as they are acting as a long term service provider to clients. The value of art is not just in monetary terms though. Investors are usually art lovers who want to enjoy their purchases as well as buy works that will increase in value. This element of personal taste means that often the role of Beaumont Nathan is ensure their purchases are in good quality and priced at an acceptable price. It is not the role of an art adviser to dictate taste to a client, or to block them from investing in an area of art they are interested in, Mr Beaumont said. He added that no matter what the personal taste of a client it is possible to find an area that will present good value as an investment. The firm tends to avoid advising investing in the ‘hottest’ parts of the market. These are often overpriced and may seem to have growth potential – but this is limited and will only last as long as it remains in favour and more individuals buy, the pair believe. Instead they look for up and coming areas, or those that are due for a reassessment and present true growth opportunities. This may be looking a particular period of an artist’s work that is currently not the most fashionable or is due for re-evaluation, or finding an artist that is predicted to rise in value. 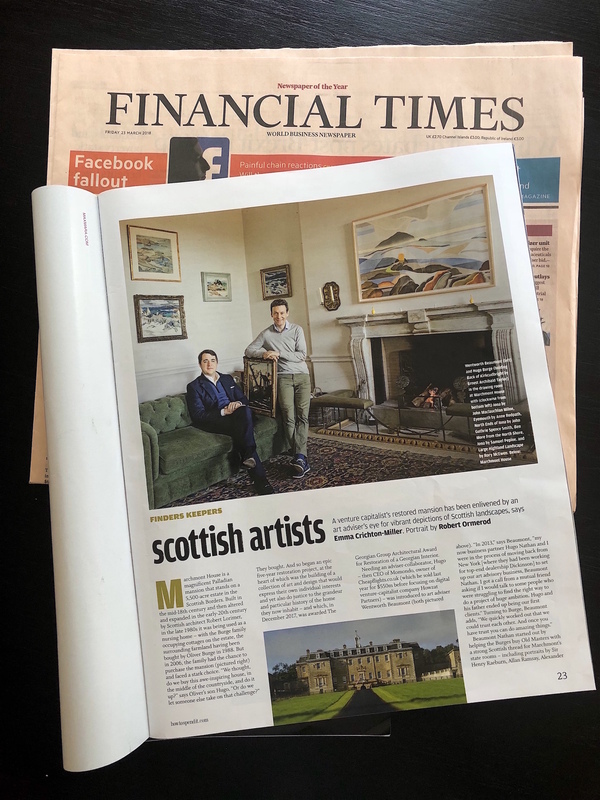 It is this mixture of personal preference and the investment value of art that Mr Beaumont and Mr Nathan aim to provide to their clients and say is at the heart of their business.